Occasionally a hardworking child sweeps fall leaves that have accumulated in her play space. Ever industrious, the child tirelessly toils to rid the area of unwanted debris. 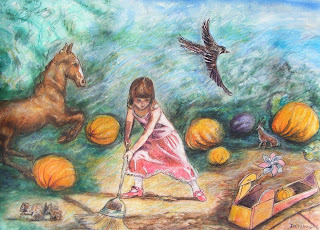 Somewhere in the inner recesses of her mind, she is toiling in the pumpkin patch. She is Cinderella perhaps, or at least, fairy tales swirl in her mind. It is doubtful that she will go to the ball, because fairy tales are just that. But perhaps a slice of pumpkin pie is in her future.